Home/ About Us/ Subsidaries/Wuhan Ya Li Ready-mixed Concrete Co., Ltd.
Wuhan Ya Li Ready-mixed Concrete Co., Ltd.
Wuhan Ya Li Ready-mixed Concrete Co., Ltd. (the “Company”) was established by Wuhan Ya Dong Cement Co., Ltd. in December 2007 with a total investment amount of RMB60 million. The Company possesses Grade II qualification for ready-mixed commercial concrete of construction enterprises. It is principally engaged in the production and sale of various types of commercial concrete and cement products. The Company has five concrete mixers, 52 mixer trucks, 5 truck-mounted boom pumps and four line pumps. The Company’s total annual concrete production capacity is over 1 million m3. The Company has two plants: Yangluo plant is located in No. 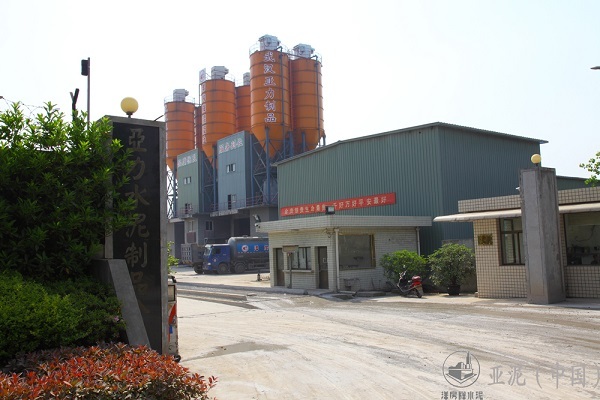 66 Yadong Avenue, Pingjiangxi Road, Yangluo Economic Development Zone, Xinzhou District, Wuhan City, with two mixers having a production rate of 180 m3/h; Dongxihu plant is located in the east of Shiyi Zhigou, Gexin Avenue, Dongxihu District, Wuhan City, with two mixers having a production rate of 180 m3/h and one mixer having a production rate of 120 m3/h. Each plant has its own laboratory, covering an area of over 200 m2 and equipped with 40 sets of testing equipment. Their laboratories have received China Metrology Accreditation, and are recognized as professional laboratories with technical competence certification. Their ability to carry out tests is on a par to that of a commercial concrete company.